Have you ever wondered what it’d be like to have a sleepover at a sacred mountaintop temple? Well, rockstar healthy chef Candice Kumai decided to find out after embarking on a wellness journey to Japan to reconnect with her roots. Here’s what happened when the California native and Well+Good Council member made a pilgrimage to one of the holiest sites in Buddhism for a week of meditation, mindfulness—and, of course, food. Last summer, after my sweet, 95-year-old Japanese baachan (grandma) passed away, I flew to Japan for her first Obon, a tradition in which we celebrate our ancestors. It felt like a powerful moment in time to embrace my heritage (my mom is Japanese and my dad is Polish-American) and fully immerse myself in Japanese wellness—all with my beloved sister, Jenni. And what better place to do all of that than Koyasan? A 90-minute drive south of Osaka, Koyasan is considered the most blessed place in mainland Japan for Shingon Buddhist monks, and one of the most sacred mountains in the world. It’s totally untouched (UNESCO added it to its list of World Heritage sites in 2004), and about half of the 117 temples let guests reserve a stay. That means that for several days, you can rest, eat, and pray with the monks. At 6 a.m. every day, we woke and got ready for an early morning prayer session with the temple’s monks. It’s definitely a journey. From Tokyo, Jenni and I had to take a subway, a train, a taxi, and a cable car to get there, but the second we walked into the crisp mountain air, my spirit began to awaken. At 6 a.m. every day, we woke and got ready for an early morning prayer session with the temple’s monks. We chanted and shared prayers with guests who had come from all over the world. My sister and I prayed for our baachan’s soul, which felt really memorable and powerful. While at the temple, we ate traditional Japanese buddhist “shōjin ryōri,” a practice of cooking known as devotional cuisine. It entailed a lot of really well-seasoned (think umami, sweet, and savory) and well-proportioned vegan meals for breakfast and dinner. (At our particular temple, there is the option of requesting lunch if you’d like). No food is wasted in the process of cooking, which adds another layer of mindfulness to everything. Each meal was served with gohan (hot steamed white rice), miso soup, and hojicha (roasted green tea), and it all felt really warming. My sister and I started every meal by saying itadakimasu, which is a way of expressing gratitude for the meal. It was, hands down, some of the best food I’ve ever eaten. It was, hands down, some of the best food I’ve ever eaten. Though we got up early to pray, the schedule wasn’t strict, and we had time to visit the many gorgeous temples, landmarks, and sacred places in Koyasan. My sister and I each found our preferred meditation spots. She liked the beautiful Japanese garden that was part of our room, while I preferred to situate myself on the steps of one of the local temples. I caught some monks ordering mochi—the traditional sweet rice and adzuki bean treat—at my favorite spot in town, and I just loved what that said to me about balance. So often, it’s really about slowing down and appreciating what we have. 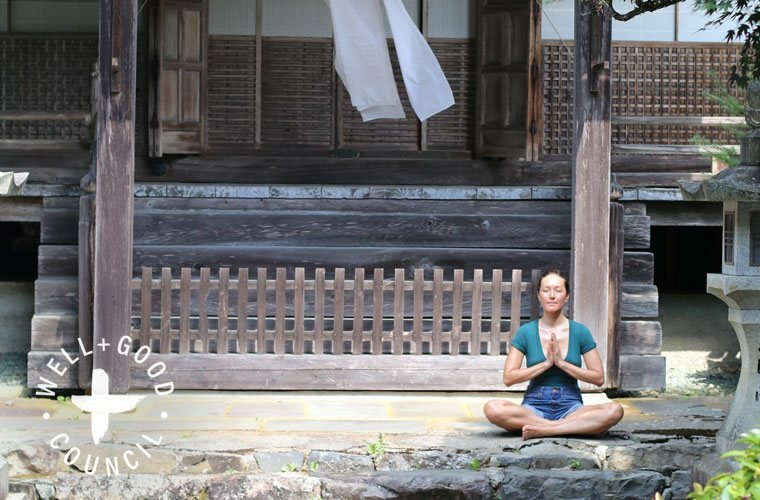 The magic of Koyasan is that every person is able to get something different out of it. Some guests tap into a new and profound love for prayer and meditation. Others find it’s a chance to reconnect with themselves and to feel more alive. My sister found the incredible history and culture to be the best parts, as well as the chill factor—the chance to just slow down and breathe. For me, the experience was such a powerful reminder to live more simply and to honor my roots and my family heritage, including my wonderful grandma. Besides having serious wellness cred, Candice Kumai is a classically trained chef, regular contributor on E! News and The Dr. Oz Show, and has served as a judge on Iron Chef America and Beat Bobby Flay. She’s currently writing her sixth book on Japanese wellness, Kintsugi Wellness, which drops spring 2018.